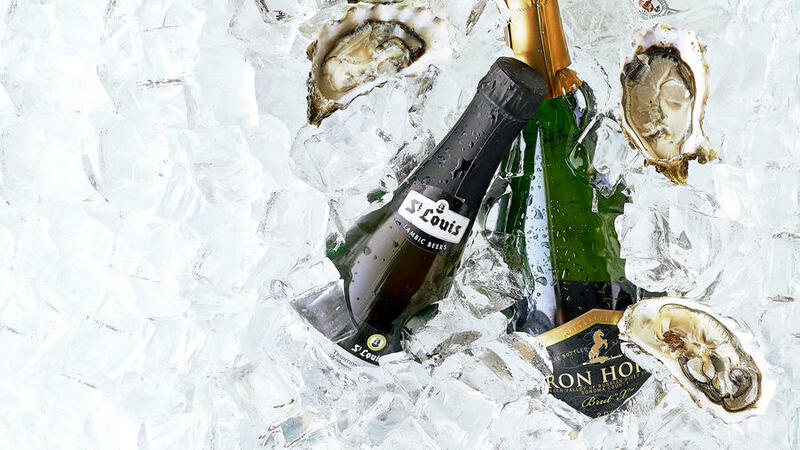 Oysters taste famously of cucumber, melon, and the sea itself; what you need in a wine to match is something extremely dry, crisp, and minerally, with loads of citrus. An herbal vein is a bonus. Skip highly fruity and floral bottles. Champagne Delamotte NV Blanc de Blancs (France; $78). Bracing citrus works like a spritz of lemon, while the wine’s melon melds into the oysters’ cucumber, and its yeastiness morphs into a nutty quality. Iron Horse 2010 “Brut X” (Green Valley of Russian River Valley; $50). This sparkling wine is as dry as they come; it brings a brininess of its own for a sea-breeze effect, with a fresh cucumber finish. Schramsberg 2012 Blanc de Blancs Brut (North Coast; $39). Pear and apple flavors in the wine punch up oysters’ sweetness, but its soy quality highlights salinity too—the best of both worlds. Buchegger 2013 Grüner Veltliner Vordernberg (Kremstal DAC; $42). This version of Austria’s main white wine is riper than most, with Asian pear and melon that link to oysters’ sweetness, but its hit of white pepper turns the match earthy. Dry Creek Vineyard 2013 “DCV3” Estate Sauvignon Blanc (Dry Creek Valley; $25). This minerally, citrusy wine creates real buzz; it loves the sea spray of the oysters, making their cucumber layer pop. Gilbert Chon Clos de la Chapelle 2013 Muscadet (Sèvre & Maine, France; $12). As the sip of choice with oysters in the Loire Valley, Muscadet combines saltiness, acidity, and citrus for a seamless match. Handley 2014 Pinot Gris (Anderson Valley; $20). A steely Pinot Gris, this one throws a bridge to all the minerality an oyster can muster; its apple and pear fruit add a sweet note to the match. Lang & Reed 2013 Chenin Blanc (Mendocino; $27). This tart, dry Chenin offers a burst of lime that renders oysters clean and bracing—a match for oyster purists. Break out of the box here: You might think that bright lagers and pilsners would make the best oyster matches, but in our tastings, extremely dry Belgian sours met the shellfish on all fronts. Hanssens Artisanaal Oude Gueuze Lambic. Entirely without fruit, this sour creates a refresh-ingly tart match. Both its racy acidity and yeastiness work well with oysters. St. Louis Gueuze Fond Tradition Lambic. A wildness in this beer brings out the exotic minerality of oysters. A shot of ice-cold vodka is a no-brainer but a little bit boring. Gin, with its foresty juniper core and slate of herbs and spices, offers more excitement (just avoid those with heady floral aromatics). And the right kind of Scotch—low on the iodine scale and moderate on the smoky peat front—is a downright delicious match. Hendrick’s Gin. This traditional dry gin creates an ironic sweet-briny contrast—the cucumber popping in the gin instead of the oysters. Junípero Gin by Anchor Distilling Company. As the name implies, juniper rules here, creating a pleasantly pungent combo with oysters. Ledaig 10-Year-Old Single Malt Scotch Whisky. Moderate peatiness acts as a bridge to the seafood brine, with satisfying spice on the finish.